So far Evelien Nijssen has created 6 blog entries. CEVEC Pharmaceuticals GmbH (CEVEC), the expert in the production of tailor-made recombinant glycoproteins and gene therapy vectors, is pleased to note that cooperation partner CellGenix, a leading global supplier of GMP raw materials for cell and gene therapy and regenerative medicine, today announced the expansion of its portfolio with the introduction of CAP®GO technology-derived preclinical grade TGF-β1 for ex vivo cell culture applications. After CellGenix® rh HGF, this is the second product originating from this cooperation. 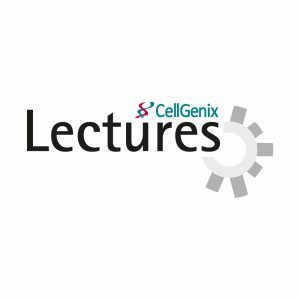 We are excited to announce the fourth CellGenix Lecture given by Prof. Luc Douay. He will present an overview of the main biological advances of the past decade for large-scale production of red blood cells. With our CellGenix Lectures we want to provide insights in the latest advances in the cell and gene therapy, and the regenerative medicine field. Blood-transfusion centers regularly face the challenge of donor blood shortages, especially for rare blood groups. The possibility of producing universal red blood cells from stem cells industrially has become a possible alternative since the succesful injection of blood generated in vitro into a human being in 2011. Although there remain many biological and regulatory issues concerning the efficacy and safety of this new product, the major challenge today for future clinical applications is switching from the current limited 2-dimensional production techniques to large-scale 3-dimensional bioreactors. In addition to requiring technological breakthroughs, the whole process also has to become at least five-fold more cost-efficient to match the current prices of high quality blood products. Prof. Douay will sum up the main biological advances of the past decade, outlines the key biotechnological challenges for the large-scale cost-effective production of red blood cells, proposes solutions based on strategies used in the bioindustry and presents the state-of-the-art of large-scale blood production. We would be happy to welcome you at our lecture. Please register for free via Lectures@cellgenix.com or T: 0761/88 88 9-0. The cell and gene therapy space has seen a great deal of growth and progress over the last couple of years as more companies are approaching late-stage clinical development and market authorization. But what does this mean for the manufacturing process? What challenges remain and how can they be overcome? We proudly announce the launch of E. coli derived recombinant human Interferon-gamma. This new preclinical product further expands our cytokines & growth factors portfolio for the cell and gene thereapy space. 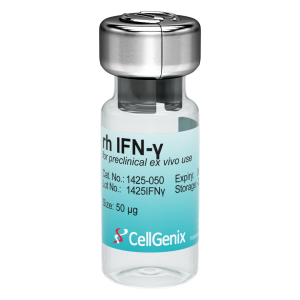 It is produced in our dedicated animal-free facility ensuring maximum safety for optimal use in preclinical cell and gene therapy applications. Bernd Leistler, our Vice President Development & Production, was interviewed by the Cell & Gene Therapy Insights about our vision on the regulatory and supply issues for raw materials. The cell and gene therapy sector has seen a rapid expansion and maturation as more companies are approaching late-stage clinical development and market authorization. 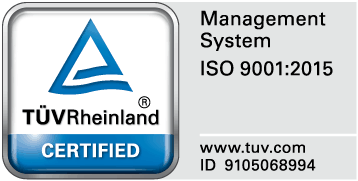 We see this reflected in an increased demand for GMP-grade raw materials and discussions about their quality requirements and regulatory guidance. Please click here to download the interview and read about our vision on the regulatory and supply issues for raw materials. 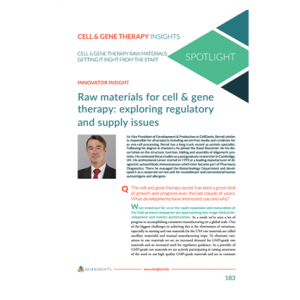 The interview was published in the Cell & Gene Therapy Insights spotlight “Raw materials for cell & gene therapy: getting it right from the start”. You can access the complete spotlight here. Freiburg, Germany, February 21, 2017 – CellGenix, a global leader in providing GMP-grade raw materials for cell and gene therapy and tissue-engineered products, started facility expansions as more customers approach late-stage clinical development and commercialization. Through early 2018, research and development laboratory as well as production and warehouse space will be added to its German headquarters in Freiburg. Consequently, new positions in research and development as well as quality control and production will be filled. The upgrade also introduces state-of-the-art, large scale, filling capacities for recombinant protein products in the existing GMP facilities. The expansion is the result of robust, sustainable and profitable growth which the company has experienced over the previous years. These advancements are reflective of the rapidly expanding cell and gene therapy space as promising therapies approach market authorization and commercialization. The experienced industry growth and strong forecasts in cell and gene therapy lead to an increased demand in GMP-grade raw materials for production. “The investment we are making is a very positive sign for the gene and cell therapy space and the future of CellGenix. It will allow us to fulfill the increasing demand for GMP-grade cytokines and serum-free media. It also shows the importance of high quality GMP reagents for safe, reliable and successful cell and gene therapy manufacturing.” says Prof. Dr. Felicia Rosenthal, CEO of CellGenix.